mikuni 28mm TM flat slide carburetor, perhaps one of the most revered of all carbs for its flawless quality and performance. this is the biggest and baddest of all carbs, now in giant 28mm size. not sure what you want to put it in. it's probably too large for most of you to deal with. only for very adventurous dudes. comes with fancy lever choke. this carb is ridiculous. I have it on my derbi revoultion. very fast bike. yay. yeah. it has a 175 series needle jet from the factory. that is a four stroke needle jet. You will have a hell of a time getting the partial throttle tuning correct with this needle jet if you're running a piston port. It's not so bad with a reed valve setup but it is still a little big boggy and very rich off the bottom end. A thing to do is switch it out to a 169 series needle jet which is more idealized for a piston port two stroke. It uses a TM24 style pilot jet and the same 4/042 6mm main hex mikuni mainjet that the vm20 tm24 use. so that' sgood there. the footprint and overall size of the carburetor is pretty large as well. It's larger than the tm24 by about 20%. 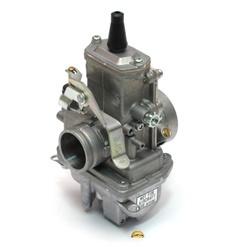 so if you are tight on space this might be the best carburetor for you. but if you have a 13500 rpm turning 18hp watercooled derbi revolution.... there's really no other option.